Dinner tonight is on me! 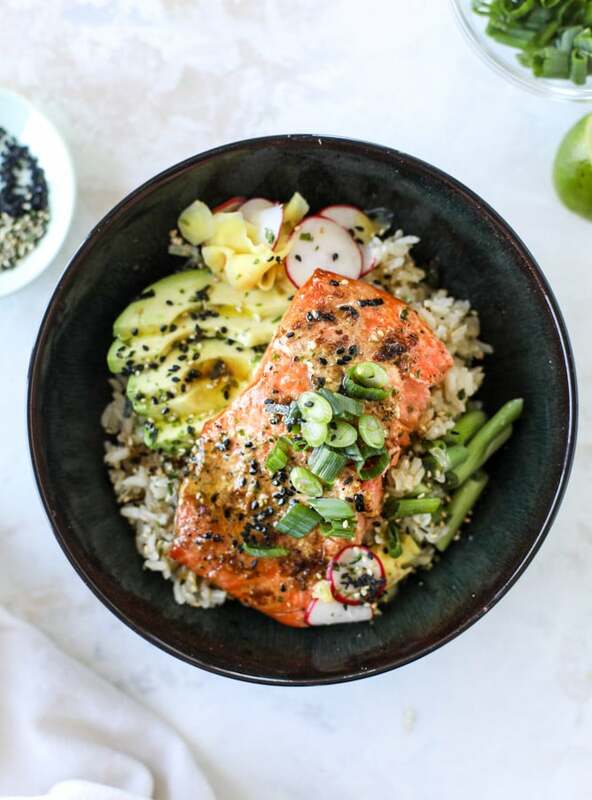 We’re talking mustard butter salmon rice bowls. Flakey, buttery salmon that is loaded with so much flavor that I can’t even STAND it. Oh my gosh. So freaking good. Oooooooh these salmon bowls are my new favorite thing. They make the most amazing dinner but also a fabulous lunch. They are so good when served both hot AND cold. In fact, I don’t know which way I love them more. First, I baked the salmon with a mustard butter spread. It is SO flavorful. But also super simple! Dijon plus softened butter and few spices. New go-to combo. I served the buttery fish on top of a bowl of brown jasmine rice. A bunch of sliced avocado, some scallions, thinly sliced radish, a sprinkle of furikake seasoning. Major taste explosion. Okay, but here’s the thing. There is an entire other part of this recipe… QUICK PICKLED GINGER! Holy cow, this stuff is so good. I’m not the hugest fan of ginger in its raw state (though I did chew on some last week when I was attempting to keep a cold from coming on) but pickling it takes it to a whole new level of love for me. It’s no secret that I love ALL things pickled. Anything briney and tart and vinegary… I’m all about it. And such a broken record. Could I tell you more? So making some quick ginger pickles has changed my life. These add even more flavor to the bowl. Such a pop of deliciousness! Also, I really just like to say GINGER PICKLES. And while I was making the pickled ginger, I threw the radish in there too. I make pickled radish often (amazing on tacos!) so I figured it wouldn’t hurt. Super good, but not necessary! I love that this is such a filling and satisfying meal but one that is super simple. You can prep everything ahead of time too, aside from the avocado. If you use a quick rice, the entire thing can be done in 30 minutes or less. We are talking an impressive, fantastic dinner in no time at all. I mean, what is it about eating salmon in bowls that makes it seem different and… well… better? Raise your hand if you’re all over this Monday meal! Place the ginger and radish slices in a jar. In a bowl, whisk together the vinegar, water, sugar and salt. Pour it over the ginger and let it sit for at least 30 minutes. Store it in the fridge for a few days! Preheat the oven to 425 degrees F. Line a sheet pan with parchment paper or foil. In a bowl, stir together the butter, mustard, garlic powder, salt and pepper. Place the salmon filet in the center of the sheet. Rub the top of the filet with the butter mixture, covering it completely. Roast for 15 minutes, until the salmon easily flakes with a fork and the top is slightly golden. Remove and slice the salmon into pieces. To assemble the bowls, add 1/2 to 1 cup of rice in each bowl. Top with sliced green onions and avocado. Drizzle each bowl with soy sauce and sesame oil. Sprinkle with furikake and serve! And so full of health that there’s room for cookies! A Week of Meal Prep with The Pretty Dish. will try this soon. Looks great! Yum! This looks like my order every time we go out to eat. Running out right now to get the ingredients for this. Sounds so delicious. What does furikake taste like? Is it spicy? it’s not spicy! it’s a mix of dried seaweed, sesame seeds, etc! Yum! Salmon anything is always my favorite. I love this idea of the butter Dijon! Yes! I could eat a bowl of pickled ginger! I’ve got both hands raised!! It looks so good. I’m always on the look out for wild-caught salmon. Next time we find it on sale I’m making this recipe. I saw this pop up on your blog yesterday afternoon, and ran straight to Trader Joes so I could make it last night. My boyfriend and I LOVED it! (We subbed in cauliflower rice and used coconut aminos instead of soy sauce since we’re dieting.) It’s buttery, comforting and filling and that quick-pickled ginger adds a burst of brightness! Drooling over here on this butter salmon bowl! I’m pretty much a “food bowl” person. So this is right up my alley! How do you grate the ginger so it’s thin for pickling? I tried issuing a mandolin and it was too think (it’s not the best mandolin to be fair) so I chopped it into matchsticks and left it for almost an hour. It’s still wayyy to spicy and not at all pickled. Any ideas? i did use a mandolin! i got a big knob of it and just used very thin grates! Five stars again! Who goes out to dinner when you can eat like this!! Thank you Jessica for another stellar recipe. This salmon, rice bowl amazing and looks mouth-watering!!! My thanks for the great recipe!! so creative, thank you, had eaten a lot of salmon sushi until I read about some of the scary things that can happen (tapeworm?) that may or may not be something to worry about, anyway, I’m back to cooked salmon just to be safe and don’t like my default salmon recipes so really appreciate this! Flavors were awesome! Thank you. Though my bowIs weren’t very pretty. I tossed some cubed butternut squash and chopped kale with some of the extra butter mixture, and roasted that too. Thank you for this recipe, which I linked to from My Favorite and My Best. I made it tonight and it was fantastic! Like a California roll in a bowl! I sliced the ginger very thin and it reminded me of the ginger you get with sushi. I will make this again and again–would be great to serve company, as it’s fancy but so simple. Delicious! These bowls came together quickly and are quite good. I took the skin off of the salmon before placing it on the baking sheet. Adding the radishes to the quick pickled ginger was a great suggestion! Thanks for sharing! This look very yummy and I want to eat this salmon recipe, Now this weekend i make this recipe for my family. Thanks guys for this recipe. When the hubs comments favorably on a fish dish, it’s a winner! Thanks for another great recipe!